Many visitors to this site have asked questions about the growth and development of young mourning dove babies. Harold Hanson and Charles Kossack (4) researched the growth and development of mourning dove nestlings in Illinois back in the 1950's to provide a better understanding of mourning dove biology because at that time there was a decrease in the size of mourning dove populations. 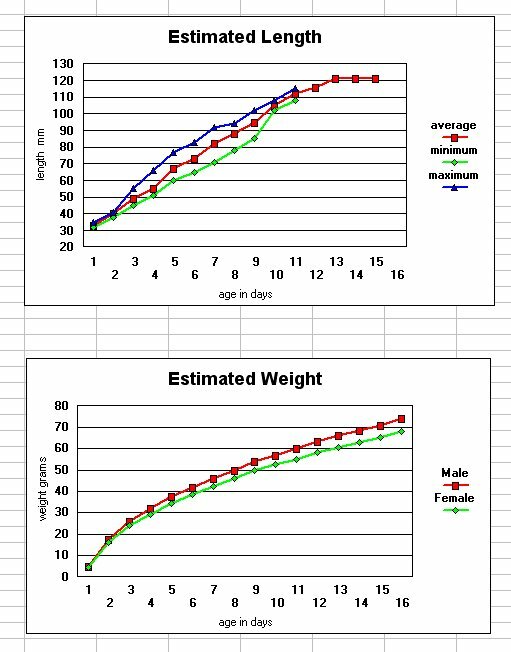 The following two charts were developed based on data included in their publication These charts will allow the reader the ability to estimate a dove nestlings age using either a ruler to measure the length of the bird or a gram scale to measure the bird's weight. Casey Mills of Springfield, Missouri had the good fortune of having a pair of mourning doves build a nest in the planter beside their front door. These two birds became especially tame and allowed her to take photographs of them from the time the eggs were laid until the young babies left their nest. Mourning dove babies are not very consistent with the time required for the babies to fledge. Gibbs, Barnes, and Cox (3) indicate the mourning dove babies fledge between 11 and 15 days. 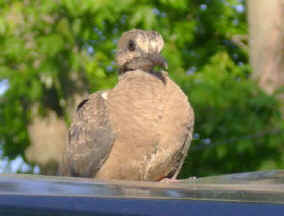 Baskett, Sayre, Tomlinson, and Mirarchi (1) indicate that doves fledge between 11 and 17 days with an average of 15 days. The babies in these photographs fledged on their eleventh day. This series show the appearance of the babies at the ages of 4, 6, 7, 10, 11, and 12 days. The babies seem to be fully feathered on the seventh day. Casey Mills only was able to provide two photos of the doves after they fledged although in her case the babies probably did not hide themselves as well as they normally do because of the familiarity of the grandparent and parent doves with the members of the Mills family. We included information on post fledging activities to provide the complete picture of the life of the baby doves before they leave their parents at an age of around 30 days. Babies that have fledged are total dependent on their parents for food and water until they are at least 18 days old. (5) Of course some babies do not fledge until they are 17 days old. If a parent is lost prior to that time the babies survival is at risk. The female's feeding interaction with the baby decrease to below 50 percent after the babies are 16 days old and cease at about an age of 20 days, the males are primarily responsible for feeding the babies after they fledge as the female becomes more involved with the new eggs. If the male is lost the female will take over the male's feeding responsibilities, but the she will offer less food than the male does and the babies will have slower growth. Male parents feed the babies from 12 day post hatching less often than the females but are primarily responsible for feeding the babies after they fledge. They normally feed the babies consistently through 24 days of age and in many cases through 27 days of age. It is assumed that the parents bring the babies water at this time but this has not been confirmed. After an age of 30 days is reached most babies are independent. Parent/fledgling feeding interactions normally occur in "reference areas" within 145 feet of the original nest up to 27 days of age. These areas are located on the ground and in trees (often on specific limbs) and are characterized by dense overhead cover interspersed with openings that facilitate the interaction. Fledglings will use more than one reference area, and will find new areas farther away from the original nest site as they grow older. As the doves grow older and their feather growth becomes complete, the area the doves frequent become further and further from the original nest site. After age thirty they will usually join juvenile flocks to fly to distant feeding sites. 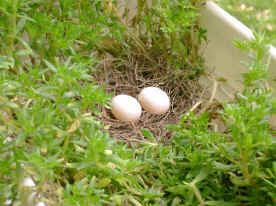 One of the parents were the offspring of a pair of doves that had been nesting in their back yard for two years. This female tried to nest in the back yard too, but her parents chased her around to the front of the house where she decided to nest in a planter that was right beside the front door and the driveway. Apparently the parents were not concerned about the family and often allowed the close approach of anyone without leaving the nest. The parents started to incubate the first egg showing no fear of the constant traffic in and out of the front door and the vehicles in the driveway. Both babies are now covered with gray fuzz and tiny pinfeathers. Because of the heat from the afternoon sun they tried to move the planter. But the parent dove, got out of the nest and stood in the old place and cooed. They moved the planter back to its original place. The babies now have more feathers and and have become so big the parents can not cover both at the same time. The parents have become quite tame and allow the family to pet its back without getting off the nest or even snapping at their hands. It has now become very hot in the planter during the late afternoon as temperatures in the shade climbed into the eighties. The parent has been seen panting. Today was the first day that the parents left the babies uncovered while they sat together on some nearby electric wires. The babies are now fully feathered and the parents no longer try to cover them. The babies are now about large enough to fledge and face the dangers of predators as they learn how to fly and peck seeds on the ground. The babies left the nest today and this photo shows both of them and one parent relaxing in the shade. This photo shows the smallest of the two babies sitting on the roof of a truck in the driveway.